The Palos Verdes Concours d'Elegance with three great automobiles with good results. 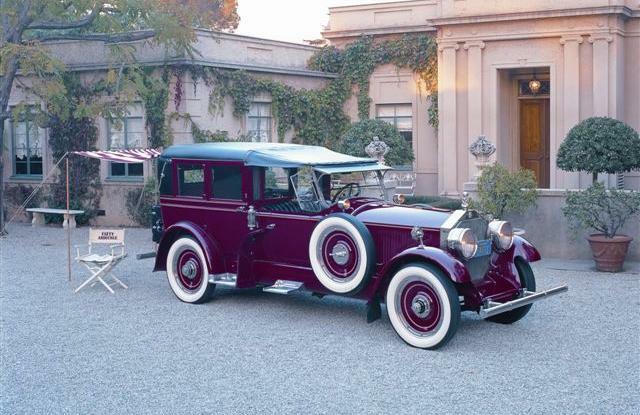 The 1930 Rolls Royce Phantom II Brewster Town Car was awarded Best in Class. The 1967 Ferrari Pinin Farina California Spyder showed well & was very popular with the attendees. The 1937 Cadillac V16 Aerodynamic Coupe received a Special Award by The Automobile Driving Museum. The Nethercutt Collection attended the annual Amelia Island Concours d'Elegance on March 13, 2016. We were very pleasantly surprised to win First in Class & later Best of Show for the wonderful 1930 Rolls Royce Phantom II Brewster Town Car, The Rolls Royce was originally owned by the very beautiful movie star Constance Bennett. The Rolls Royce is one of the most strikingly beautiful automobiles of the 1930's with it's rakish v-shaped windshield & side windows & the elegant hand-painted cane work siding. The Constance Bennett Rolls Royce appeared in many great movies of the 1930's including MGM's "The King & The Chorus Girl". The 1912 Alco was well received by the Amelia Island attendees, but did not place in judging. San Marino Concours d'Elegance June 14 2015 The Nethercutt Collection's 1913 Mercedes 37/95 Tourer won First in Class & our 1931 Bugatti Dubos Coupe also won First in Class. June 1, 2008: The L.A. Concours d’Elegance in Pasadena, CA, was attended with the 1937 Talbot-Lago. The car won Best of Show, helping it set an all time record for the Collection by winning six Best of Shows in seven events — the most Best of Shows any car in the Collection has been given. Jack Nethercutt was also awarded the prestigious Lee Iacocca Award, which honors those who further the preservation and restoration of cars. March 12, 2010:Three Nethercutt Collection automobiles were entered in the Amelia Island Concours, the 1912 DeDion Bouton Roadster, 1913 Chalmers Touring and 1934 Packard LeBaron Sport Phaeton. Special awards were collected by all three. Jack & Helen Nethercutt receiving First in Class & Honorary Judges Best in Show award for the 1913 Mercedes 37/95 Double Phaeton Torpedo at the Dana Point Concours d'Elegance. Both the Bugatti & the Mercedes received First in Class before the overall win. Sunday, September 16 The Nethercutt Collection scored big at the Palos Verdes Concours d'Elegance all three Nethercutt cars wre entered in the "French Curves" class & won a very impressive First,for the 1931 Bugatti Type 51 Dubos Coupe, a second place for the 1937 Talbot Lago Type 150- C-SS Coupe and a Third place for the 1912 DeDion Bouton Roadster, totaly sweeping the class. Then, at the end of the day, The Bugatti was awarded a coveted Best of Show. The Nethercutt Collection transported two Museum cars to the Amelia Island, Florida Concours d'Elegance with excellent results. The beautiful one-off 1938 Lincoln Model K Judkins Touring Coupe scored First in Class of the featured Lincoln Class against an unbelievable group of contenders. The surprise win delighted the Nethercutt contingent as the Nethercutt Lincoln was restored many years ago and was not thought to be in the running for an award. The newly restored 1936 Duesenberg SJN Rollston Convertible Coupe won First in Class in the Duesenberg Class and was then selected by the Concours judges as Best of Show. The beautiful Duesenberg was spared being drenched with champagne as Amelia Concours dElegance founder Bill Warner aimed the spray away from the car. Held in beautiful Lacy Park in San Marino the event was blessed with perfect weather & beautiful cars. The Nethercutt Collection's 1938 Lincoln Model K Touring Coupe by Judkins was driven from the Museum to San Marino & back without incident, and received a 2nd in class. 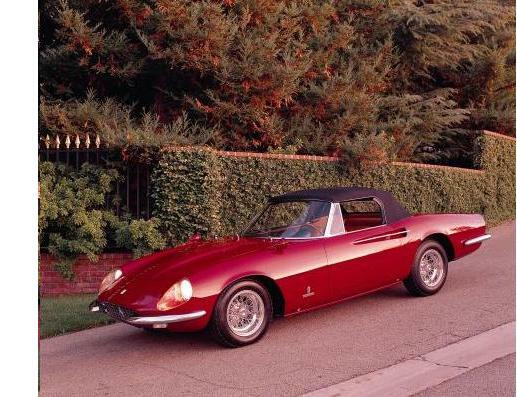 The Nethercutt Collection's 1967 Ferrari model 365 Pininfarina California Spyder was driven to Beverly Hills under it's own great power, & was admired by throngs of visitors to the annual Fathers Day free event. June 20, 2010: The Nethercutt Collection’s 1934 Packard LeBaron Sport Phaeton “Hussy” was shown at the Rodeo Drive Concours d’Elegance where she received "Best of Show". March 9, 2008: At the Amelia Island Concours d’Elegance, the 1938 Mercedes-Benz Cabriolet A won the Mercedes-Benz Star of Excellence for the Most Elegant Mercedes-Benz and the 1937 Cadillac Series 90 won the Claude Nolan Cadillac Award for the Most Elegant Cadillac. Sunday June 12, 2011 the Nethercutt Collection's 1926 Pierce-Arrow Model 33 Roadster was shown at the San Marino, California Grand Classic and was awarded a First in Classic Car Club of America competition. The Nethercutt Collection's most recent restoration the 1938 Mercedes Benz 540K Cabriolet A won First in Class at The 2012 Pebble Beach Concours d'Elegance Sunday August 19. Facing stiff competition the beautiful black & chrome beauty was chosen First in it' class& was in competition for Best of Show, but narrowly lost to another Mercedes that was judged First in the Saoutchik coach-built class. The beautiful 1930 Ruxton received First in Class and was a crowd favorite due to it's unusual & original paint scheme of horizontal bands of color. One of only four surviving multi-colored Ruxton Sedans, it is the only one with a maroon paint scheme. The color schemes horizontal bands were developed to emphasize the overall lowness of the car by 1920 & 30's theatre set designer Joseph Urban. 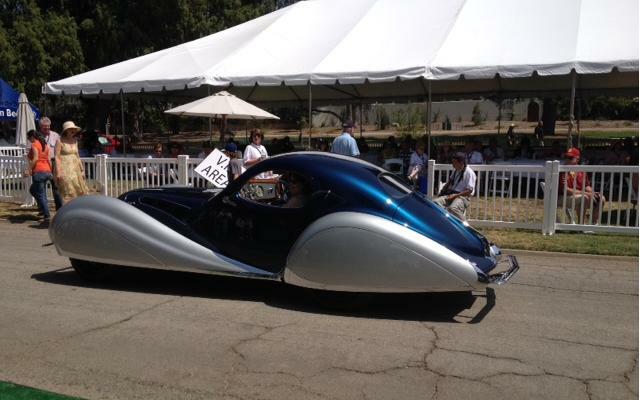 The Nethercutt Collection participated in the Palos Verdes Concours d'Elegance with wonderful results. The 1930 L29 Cord Town Car won Best in Class and Most Elegant, with the trophies being presented by Chris Cord grandson of E.L.Cord the manufacturer. 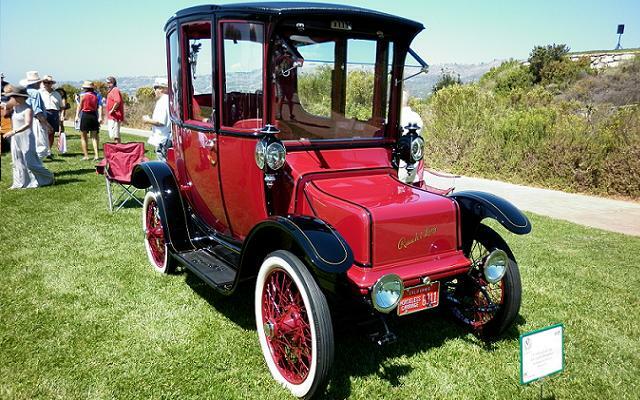 The 1914 Rauch & Lang Electric Brougham scored Best in Class. And the beautiful 1912 White Touring Car won 3rd in Class. September 16, 2007: Four cars received five awards at the Palos Verdes Concours. The 1911 Moon won First in Class; the 1931 Bugatti Dubos won a special award for being on display (non-competing); the 1932 Rolls-Royce Phantom II was also only on display, nevertheless winning First in Class; and the 1937 Talbot-Lago won First in Class and Best of Show. June 27, 2010: The Nethercutt Collection’s 1934 Packard LeBaron Sport Phaeton “Hussy” was also shown at the Dana Point Concours d’Elegance where a 1st in Class and “Peoples Choice” were awarded. Also entered at Dana Point was the 1912 DeDion Bouton Roadster, which was awarded "1st in Class". March 13, 2011: Jack & Helen Nethercutt were thrilled to be recipients of the coveted Best of Show award at the Amelia Island Concours d'Elegance. 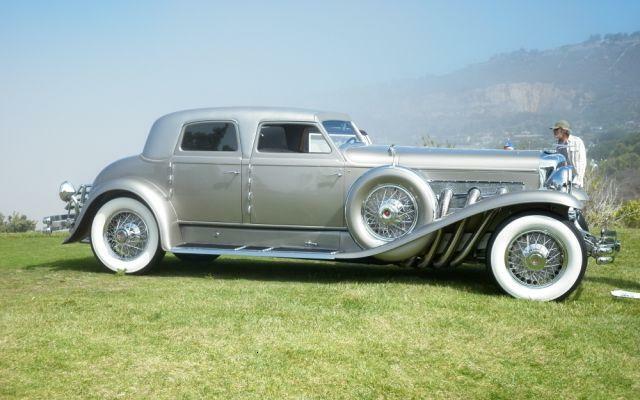 The beautiful Duesenberg had been restored over 30 years earlier & won Best of Show at Pebble Beach in 1979. Although the car was not entered in competition at Amelia Island it overwhelmingly was selected as Best of Show over some 320 competitors. The annual Dana Point at the St. Regis, Monarch Beach resort event was attended by the same two cars that attended the Amelia Island Concours with very similar results. The 1936 Duesenberg SJN Convertible Coupe by Rollston won First in Class & Most Elegant & the Lincoln Judkins Coupe placed a very respectable 3rd in Class. Pebble Beach, the world's premier automotive Concours d'Elegance was attended by three Nethercutt Collection cars, the freshly restored 1933 Hispano Suiza J12 Coupe DeVille by Henri Binder, the 1938 Lincoln Model K Judkins Coupe & the 1921 Lincoln Model L Phaeton, one of the earliest Lincolns known to exist. The Lincolns were in a special Lincoln class & were diplayed beautifully. 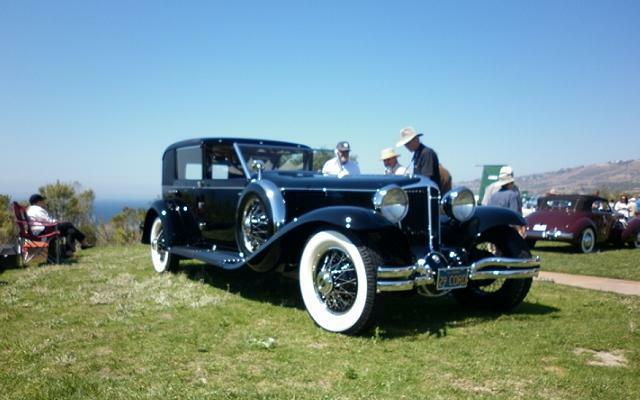 The Hispano Suiza scored 3rd in Class. The Nethercutt Collection participated in the annual Amelia Island Concours d'Elegance March 9-11 2012 showing the 1930 V-16 Cadillac Model 452A Dual Cowl Phaeton, know as Bumblebee & the 1923 McFarlan Knickerbocker Cabriolet. The Cadillac, shown entering the show field, received a Second in Class Award & the McFarlan, originally owned by silent movie star Fatty Arbuckle was warmly received & was a crowd pleaser. September 12, 2010: The Kirkland Washington Concours d’Elegance, one of our favorite events each year, was attended by our 1934 Packard LeBaron Sport Phaeton & the 1904 Cameron Rear Entrance Tonneau. Both cars were well received & both won Class awards. September 9, 2007: Held in Washington state, the Kirkland Concours d’Elegance was attended with two beauties: the 1937 Talbot-Lago, which won First in Class, People’s Choice and Best of Show, and the 1910 Pierce-Arrow, which won First in Class. 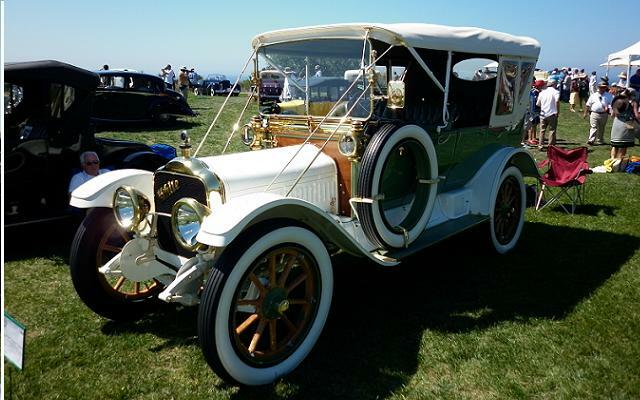 September 13, The Kirkland Concours d’Elegance was held in Kirkland, Washington, attended by two Nethercutt Collection cars, the 1903 Peerless Rear-entrance Tonneau which scored “First in Class and the 1913 Mercedes 37/95 Phaeton-Torpedo, “Third in Class”. Additional car, 1931 American Austin Roadster owned by Mr. and Mrs. Nethercutt scored “Second in Class”. September 19, 2010: The Palos Verdes Concours d’Elegance, a great venue overlooking the Pacific Ocean, was attended by three Nethercutt Collection cars the 1913 Mercedes Double Phaeton, the 1926 Pierce-Arrow Roadster & the 1932 Austro Daimler Alpine Sedan. Interestingly, the cars were awarded 1st, 2nd & 3rd, in that order. The Palos Verdes Concours is held annually at beautiful Palos Verdes Trump Golf Course. The event attracts some of the top show cars in the world. The Nethercutt Collection's 1933 Duesenberg "20 Grand" Rollston Torpedo Sedan won First in Class. Also exhibited were the 1923 McFarlan Model 154 Knickerbocker Cabriolet, originally owned by silent movie star Roscoe "Fatty" Arbuckle and the 1930 DuPont Town Car. J.B. Nethercutt's first restoration and his first Pebble Beach Best of Show winner. October 17, 2010: The Pasadena Art Center College of Design one of the world’s most prestigious schools of automotive design annually holds an invitational show to showcase automotive design. 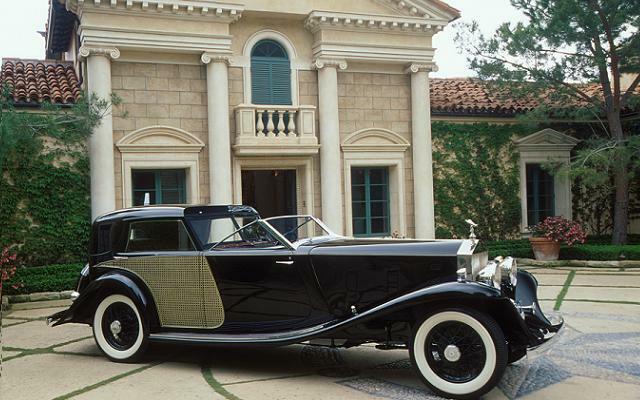 The Nethercutt Collection participated with the 1932 Maybach Zeppelin Cabriolet. The Maybach was awarded “Best Finish”. September 13 the Palos Verdes Concours d’Elegance was attended by two Nethercutt cars. The 1930 Rolls-Royce Phantom II Brewster Town Car won “First in Class” and “Best of Show” while our 1923 Hispano-Suiza H6B Cabriolet DeVille also scored “First in Class”. Altogether this was a very exciting and successful event. June 17, 2007: The Rodeo Drive Concours d’Elegance was attended with two cars: the 1911 Pope-Hartford Seven Passenger Touring and the 1937 Talbot-Lago T150C-SS Coupe. The Talbot-Lago won Best of Show. 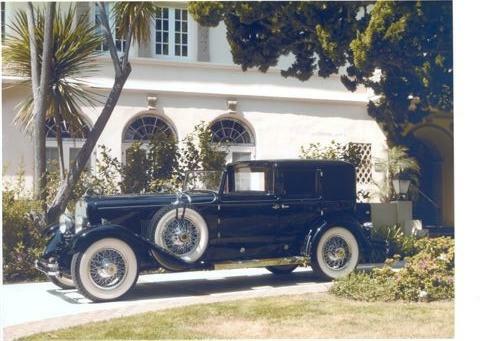 June 3, 2007: The Los Angeles Concours d’Elegance was attended with the 1930 Ruxton Saloon. It was awarded Most Elegant and First in Class (Classic Closed). The Pebble Beach Concours d’Elegance August 12-16, a nearly week-long event, was attended by our newly restored 1912 De Dion Bouton V-8 Roadster, the 1931 Bugatti Type 51 Dubos Coupe, and the 1936 Duesenberg SJN Convertible Coupe. The Duesenberg and the Bugatti successfully completed the Thursday, Pebble Beach Tour d’Elegance, and were awarded ribbons by arriving at the end of the Tour in good order. Show results were excellent, The De Dion Bouton scored “Best in Class, Antique” and the”Charles Chayne Award for Engineering Excellence” and the Bugatti won “Best in Class, Bugatti”. The Duesenberg was not entered for awards and was shown Exhibit Only. August 15, 2010: The Pebble Beach Concours d’Elegance this year honored the Pierce-Arrow marque. The Nethercutt Collection stepped up & showed four Pierce-Arrows, Our freshly restored 1926 Pierce-Arrow Series 33 Dual Valve Six Runabout won First in Class against very stiff competition. The additional three; The 1918 Dual Valve Six Touring and the 1937 Pierce-Arrow Limousine towing the Pierce-Arrow Travelodge travel trailer, were entered for exhibit only and were very well received by Pebble Beach attendees. May 6, 2007: The Hillsborough Concours d’Elegance was attended with the 1910 Pierce-Arrow Seven Passenger Touring. The car won Best in Class (Antique) and the Honorary Judges Award. March 9, 2007: The Amelia Island Concours d’Elegance in Florida was attended with three cars: the 1914 Rauch & Lang Electric Brougham, the 1909 Gobron-Brillie Tourer and the 1937 Talbot-Lago Coupe. All three received First Place Blue Ribbons and the Talbot-Lago was awarded the Best of Show trophy. The Los Angeles Concours d’Elegance held June 7 was attended by the 1930 Cord L-29 Town Car and the 1955 Austin-Healey 100M Roadster. The results were: L-29 Cord, “Best in Class” and the Austin-Healey scored “Third in Class”. March 15, 2015 Amelia Island Concours d'Elegance. This 1901 Toledo Steam Runabout from the Nethercutt Collection won First in the Horseless Carriage Class, our 1913 Mercedes 37/95 Tourer won First in class for Antique Foreign & our 1931 Stutz DV32 LeBaron Sedan won First in Class American. Altogether a very successful event. The Amelia Island Concours d’Elegance March 13-15 was attended by three Nethercutt Collection cars, the 1909 Packard Model 30 Runabout, the 1930 Cord Model L-29 Town Car & the 1930 Ruxton Front Drive Sedan. 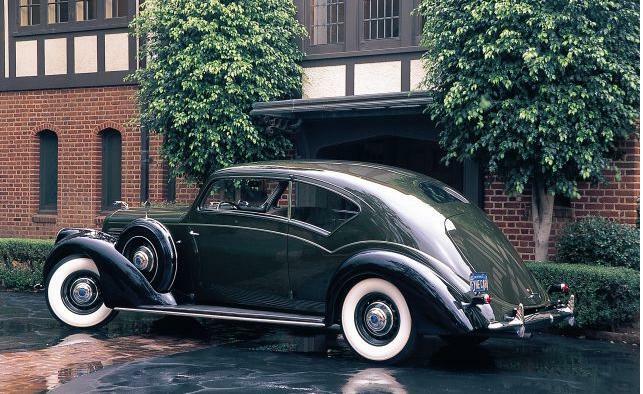 The L-29 Cord scored “Most Elegant” in Show and the Ruxton won “Best American Classic”.